In the previous pAsuram, AzhwAr spoke about the happiness that the ocean had in attaining emperumAn. In this pAsuram, he says that when emperumAn left that ocean and incarnated himself, some persons had the fortune of enjoying him. When he gave happiness to the egoistic celestial people, should we wonder about his grace on the ocean? Let us look at the pAsuram and its meanings. peRRAr thaLai kazhalap pErndhu – nanjIyar mercifully said that this line alone [in this pAsuram] speaks about krishNAvathAram. There are several interpretations for this line: (1) emperumAn came from SrIvaikuNtam so that the chains tied to the legs of dhEvaki and vasudhEvar, his parents, would snap; (2) since their chains snapped, they were able to move out of the prison cell; (3) emperumAn uprooted himself and incarnated. Once he was born to them as their child, their problems disappeared. Another interpretation – peRRaAr also means those who got or attained. Thus, those who attain emperumAn have their chains (to samsAram, the materialistic realm) removed. In this case, along with the word pErndhu, the words Or kuRal uruvAy should be added and the following meaning should be added “emperumAn did more than that”. peRRAr – just as someone gets a treasure, AzhwAr says, “didn’t these people get the benefit!”. When the chains of those who deemed emperumAn as their son snapped, should one speak of the snapping of chains of samsAram of his followers? Thus it is amply clarified here that all the hurdles of those who connect with emperumAn will be removed. He removes whatever his followers deem as a prison [hurdle]. The same meaning was conveyed by nammAzhwAr in thiruvAimozhi 2-8-2 “pUNthanduzhAy en thani nAyagan puNarppu – vIdu mudhalAm” (the connection with emperumAn will grant us SrIvaikuNtam). Or kuRal uruvAy – In the earlier sequence, AzhwAr mentioned about the snapping of chains by emperumAn by his action of coming [from SrivaikuNtam]. In this sequence, he mentions about how the chains of celestial persons got snapped by a single act of emperumAn. He talks about how his dwarfish figure, which he took by even destroying his great form, became a feast for the eyes. He took such a dwarfish figure that the dwarfs of the world would like his magnificent thrivikrama form. It is this incomparable form that AzhwAr describes by the word Or (unique). seRRar – refers to enemies. Does emperumAn have enemies? The enemy of his follower (indhra, the lord of celestial persons) is his enemy. In mahAbhAratham udhyOga parvam 91-27, krishNa says “dhvishadhannam nabhOkthavyam dhvishadhantham naiva bhOjayEth, pANdavAn dhvishasE rAjan mama prANA hi pANdavA: ” (one should not take food from enemies; one should not offer food to enemies. Oh King! You are inimical to pANdavas. Aren’t pANdavas my life!) while speaking to dhuryOdhana. 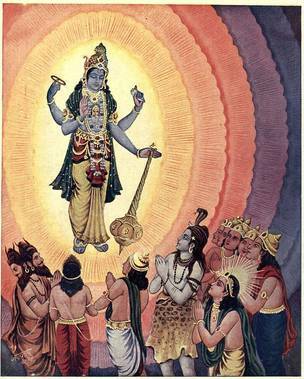 In vishNu dharmam 37-2 krishNa tells arjuna “yasthvAm dhvEshti sa mAm dhvEshti yasthvAmanu sa mAmanu, abhEdhEnAthmanO vEdhmi thvAmaham pANdunandhana” (Son of pAndu! Whoever treats you as an enemy treats me too as an enemy. Whoever follows you, follows me too. I do not think of you as anyone different from me). Thus, enemies of emperumAn’s followers will be his enemies too. jithanthE sthOthram 2 says “dhEvAnAm dhAnavAm cha sAmAnyamadhidhaivatham” (emperumAn is equal toward dhEvas [celestial persons] and demons). Thus he does not have any enemies of his own! Those who are enemies of his followers, possessing demonical qualities, will become his enemies. In SrI bhagavath gIthA 9-29, krishNa says “samOham sarvabhUthEshu na mE dhvEshyOsthi na priya:, yE bhajanthi thu mAm bhakthyA mayi thEshu chApyaham” (I am equanimous towards all species; I have neither enemies nor friends. Those who hold on to me with love are with me; so am I with them). Thus he does not see any difference among his followers. nammAzhwAr says in thiruvAimozhi 1-6-3 “Idum eduppum il Isan” and in thiruvAimozhi 1-6-5 “koLgai koLAmai ilAdhAn eLgal irAgamilAdhAn” conveying the same meanings. Among his followers, he does not distinguish between those whom he considers as being dear to him and those whom he considers are not dear to him; he does not think that he will get some jobs done through certain people and will avoid certain other people; he does not show affection towards some and enmity towards others. It is said that he treats sage vaSishta and hunter tribal person Sabari equally. seRRAr padi kadandha – he measured the worlds that enemies [of indhra, the lord of celestial persons] such as mahAbali thought were theirs. padi kadandha – he felt ecstatic as if he got what he could never get, after measuring all the forests and hillocks. sem kaN – his eyes became reddish in colour due to the happiness that he felt after getting the worlds, as if they were not his in the first place. mAl – this word indicates the great stature that he got after getting all the worlds under his divine feet. naRRAmarai malar sEvadiyai – his divine feet which became reddish in colour, similar to the fresh lotus flower. vAnavar – the celestial people who consider themselves to be in the attic where the simplicity of his incarnation will not be felt on them. kai kUppi – even when he had incarnated on the earth, they stayed where they were and saluted and worshipped him. nirai malar koNdu – with illustrious followers, which have been strung in an orderly way. EththuvarAl – will worship! They have attained him with flowers, while a sinner such as I have lost him. ninRu nirai malar koNdu EththuvarAl – similar to people who are able to withstand floods and stand firmly, they will worship him, after having his dharSan (vision). The word nirai could be compounded with vAnavar as nirai vAnavar which will mean lot of dhEvas; thus lot of celestial persons will worship him with flowers. The meaning for the word EththuvarAl is as said before – when he incarnated here, those who were in other worlds [celestial people] worshipped him from there, while, I, remaining very much here, lost out. We shall take up the 21st pAsuram next. This entry was posted in iyaRpA, mudhal thiruvandhAdhi on June 29, 2017 by T N Krishnan.